How Will We Imagine Slavery in 2015? Here is another story for those of you who doubt that we are witnessing a radical shift in our popular perceptions of the Civil War and the history of slavery. 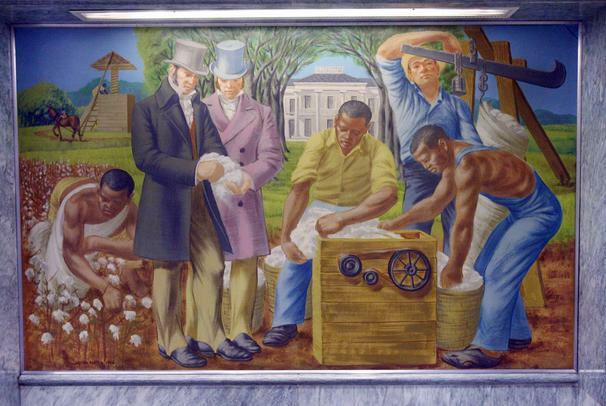 Gary Black, the newly elected agriculture commissioner in Georgia, has ordered that a series of murals depicting slavery be removed from the building. The murals were painted in 1956 by George Beattie to show the evolution of agriculture in the state from Native Americans through the twentieth century. I do hope these murals find a new home so they can be appreciated and even interpreted for their historical value. According to the news story, Black is replacing a commissioner who occupied the position since 1969. This shift in popular thinking about slavery is still, in my mind, best understood in terms of what it finds offensive or problematic. The Lost Cause view of slavery, with its emphasis on paternalism, has already been put to rest by scholars and we can begin to discern the consequences of this from the controversies surrounding Governor McDonnell’s Confederate History Month Proclamation to the recent coverage of the sesquicentennial of South Carolina’s secession. What is not clear is whether the next few years and a more rigorous engagement with the history and legacy of slavery will leave us with any lasting impressions. On this day 148 years ago the Emancipation Proclamation went into effect and yet as a nation we do nothing to mark the occasion. How strange in a nation that celebrates a narrative of the gradual embrace and expansion of freedom. Just a thought here. Although I’m certainly not one of those who claim the EP didn’t free any slaves, the fact is, slavery’s abolition was a gradual process until the 13th Amendment. B. Gratz Brown, who I’m writing about on my blog, was ecstatic when he heard about Lincoln’s EP, and bitterly disappointed when he discovered it did not cover Missouri. I wonder if the fact that the EP didn’t immediately abolish slavery thoughout the nation has impacted how it is celebrated (or not). Just read Brooks’ latest post at Crossroads. I think he is also suggesting this might be a factor. I had that post in the back of my mind when I wrote it. For what it’s worth, I’ve noted in recent years that although Juneteenth (June 19) is the anniversary of the formal announcement of the Emancipation Proclamation in Texas in 1865 (and has been celebrated here in the African American community all the way back to the 1880s or earlier), it’s increasing observed unofficially in other parts of the country, including Minnesota, were I saw posters up several years ago while visiting. Given that Emancipation was a gradual, rolling process, happening in most cases only when Federal troops arrived to enforce it — Juneteenth seems to me as practical as any to commemorate the event. A few years ago, I had a Realtor friend (in Denver) who had grown up in SC’s Edgehill District. One January I saw her and asked about her Christmas. She said she had gone home for the holidays and I made some small talk and asked if she had enjoyed the dropping of the Times Square ball on New Years Eve. Her response startled me: she had never seen that! Her father was the minister of an AME Church which went back to slavery days and on December 31, the parishioners gathered at the Church, as they had since the last day of 1862, to spend the night in prayer until the New Year. Juneteenth is a late addition to African-American holidays — in most of the South, blacks celebrated Emancipation Day. This is fascinating on so many levels. First, it is amazing that it is happening at all. Second, Black is Republican, and given assumptions of many today, not likely to do what he did. Third, a window into Georgia’s past could conceivably be opened and explored, offering even more avenues into a better understanding of the state’s (and of the nation’s) history. I do not agree that the paintings offer an indictment of Georgia as part of a slave society. The themes portrayed seem pretty commonplace for a 1950s version of the Civil War era seen through a Lost Cause lens. However, what fascinates me is that Oglethorpe “dreamed of making Georgia a classless society free of slavery”. If this is so, what happened? How many people know what happened? And isn’t it worth finding out? From Oglethorpe’s dream to the reality of chattel slavery is most definitely a part of American history played out over and over again–that is, a dream not only not realized, but gone horribly wrong. Perhaps in this century we will actually achieve the American dream of freedom. That remains to be seen. As I watched a group of African American children play with a group of white children on our sugar sand road in my integrated neighborhood down here in the Deep South the other day, then turned on the TV and listened to our first African American president speak, that dream seemed a little bit closer. Again, Happy New Year, Kevin. What a great post. One wonders if Beattie was aware of this aspect of Georgia’s history when he was commissioned in the 1950s. Thanks, Sherree. You’re welcome, Kevin. And thank you for your years now of blogging day in and day out. What an enormous amount of energy that must take! Yes, that is a great question–did Beattie know of that aspect of Georgia’s history? I certainly did not, until just a few minutes ago. I don’t think of Georgia and of the failed dream of a classless slave free society in the same thought, and I mean no disrespect to people who live in Georgia. Wow! You guys in the blogosphere are really starting the year off beautifully. Thanks to all of you. I am also quite pleased with the most recent wave of new Civil War blogs. The content is solid and each offers an important emphasis and perspective. Yes. Blogs, old and new, continue to grow in importance. Also, it is a privilege to be able to rather quickly confirm–or not confirm–what appears in newspaper articles. For instance (and as I am sure historians know, but, not perhaps the general public) Oglethorpe’s dream may not have been that utopian, after all, but somewhat more utilitarian in nature. Thanks, Kevin. In addition to being a great blogger, teacher and historian, you are also a mind reader. I was thinking—-now I wonder what books Kevin might recommend……Have a good one and speak to you when we speak. It’s only January 2, and already a lot of territory has been covered. Bodes well for the coming year. Juneteenth, as Andy says, is the Texas answer, which also follows popular tradition. But it’s a good point that emancipation, after all these years, is not directly commemorated nationally.